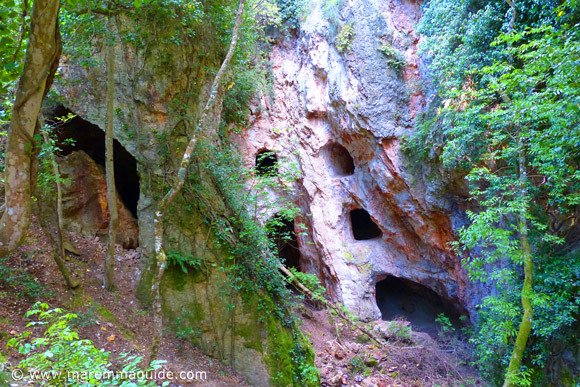 The Parco Naturale di Montioni: once home to French petticoats and now to wolves! 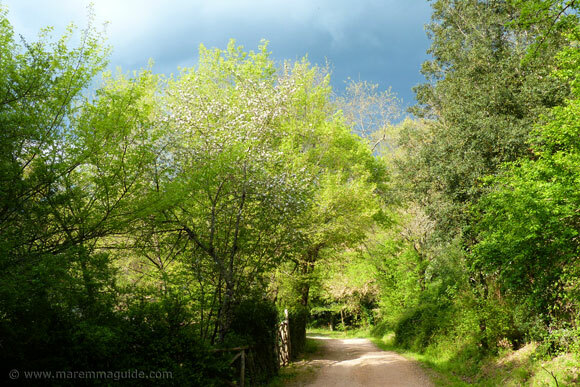 A woodland in Maremma is never just a woodland. 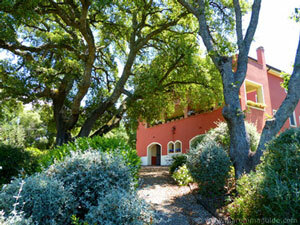 And the Parco Naturale di Montioni is no ordinary Maremma wood. In this one, a spa was built so that the petticoats of a French Princess could be taken off in private to enable her to bathe in the hot sulphur waters of natural woodland springs. But not just any French Princess: this one also happened to be the Grand Duchess of Tuscany, the Princess of Piombino and Lucca, who brought French Champagne vines with her when she came to Maremma to rule from Montioni as her big brother's puppet Duchess. 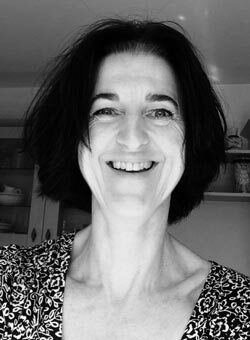 The wooded hills and coast of Maremma offered Elisa a completely different life from the cold rejection of the nobility of the Duchy's capital city, Florence. 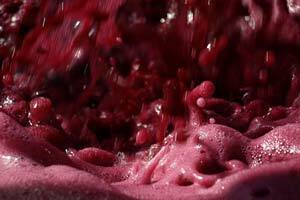 A backwater it might have seemed to some for a princess, but she revived it and made it home, bringing with her cotton plants and growers from America, expert olive farmers from Lucca, and Bordeaux vines and winemakers from France. 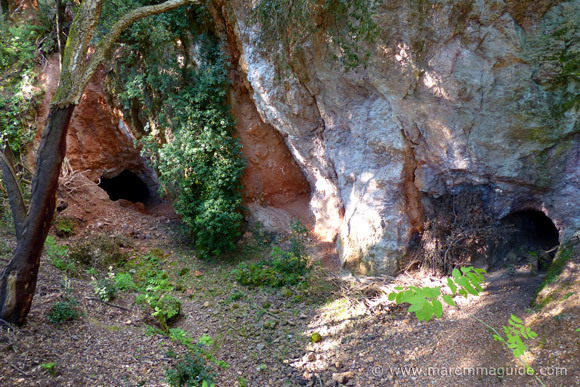 "Le cave d'allume" - the alum mines. The remains of Elisa's presence isn't the only history you will see if you take a walk through the woods. For they also hold evidence of the development of early man and are home to history in the making. Do a little map reading before you go to get the lay of the land and open your eyes whilst on route and you will see evidence of mans habitation, mining and cultivation of the woods through prehistoric, Etruscan, Roman, and medieval times, as well as more modern day but now abandoned, shepherds and wood cutters huts, coal furnaces and charcoal kilns. Two rivers run through the park - the Fiume Cornia and the Fiume Pecora - and alongside both and in their valleys there are traces of Mousterian Neanderthal man from the middle Paleolithic, early upper Pleistocene period. Keep a really good eye open - my grandfather taught me what to look for from the moment I could walk! - and you might even be lucky enough to spot a flake tool or two from the middle Paleolithic that dates from around 100,000 to 40,000 BC. Today, the Parco di Montioni is also home to something very special indeed on this planet of ours as the number of places where it can be said to be true are sadly far and few between. Montioni has an internal reserve, half of which has been untouched by man for more than thirty years, in which wild wolves have recolonised and now venture into the rest of the park. And it is huge: it covers approximately 7,000 hectares that roughly coincide with the territory of the ancient "Foreste Demaniali di Follonica" - the State Forest of Follonica. 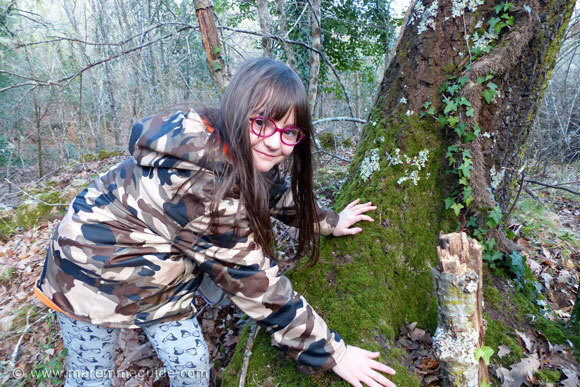 When a wood isn't just a wood then, but it is the Parco Naturale di Montioni. A haven for archaeologists, historians, geologists, wildlife photographers, walkers, mountain bikers, and lovers of rare plants... to name just a few. The park is also known as the Parco di Montioni, the Parco Interprovinciale di Montioni, and the Montioni Natural Park. The Parco di Montioni in April. After Neanderthal man, the Etruscans, Romans, and the middle ages, came the French Princess bringing with her French olive trees, vines, and prosperity. 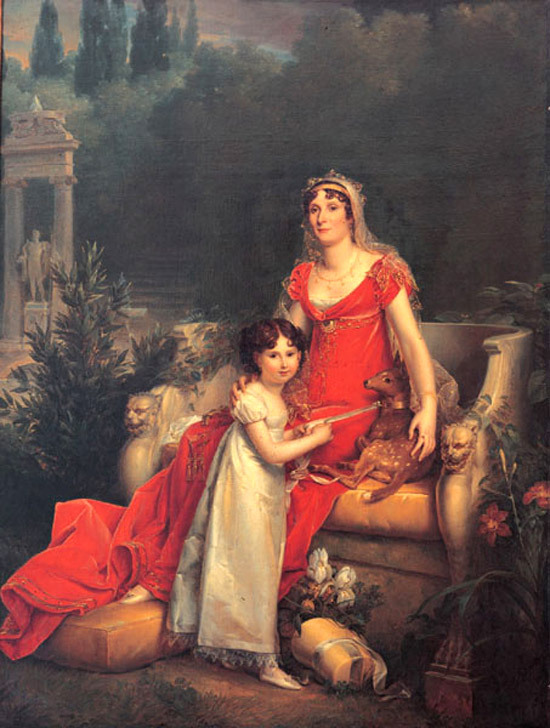 Elisa Bonaparte with her daughter Elisa in the Giardino di Boboli in Firenze, painted in 1811 by Francois Gerard. In the middle ages and Renaissance, alum was an essential chemical in the tanning of leather industry and the fixing of dyes dyeing in wool and silk. 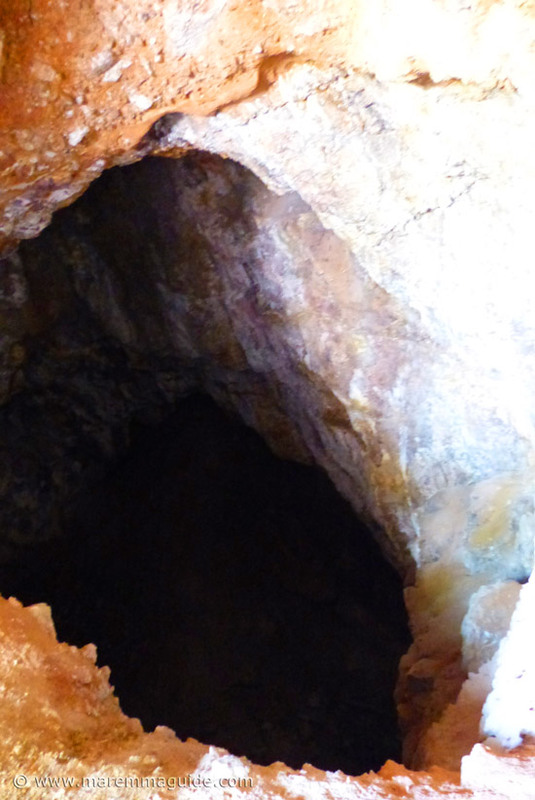 If you were the owner of an alum mine, you were a rich man. Despite the discovery and manufacture in 1788 of artificial alum by the French chemist Jean-Antoine Chaptal, which threw the alum mining industry into chaos, with a newly appointed Direttore delle Allumiere di Montioni, Elisa made the Duchy of Tuscany rich with the expansion and marked increase in productivity of the Montioni mines. She did it at the same time as bringing a humane dimension to the whole affair, improving the infrastructure, living conditions and health of the mining community. It is hard to imagine looking at it now but Elisa's maid would have undressed her here to bath in the thermal waters. 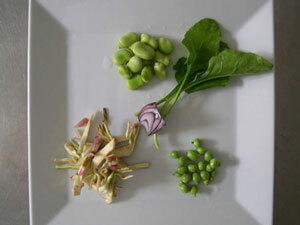 You will smell them before you see them! As today, overgrown and not flowing at any rate, they stink is of rotten eggs. 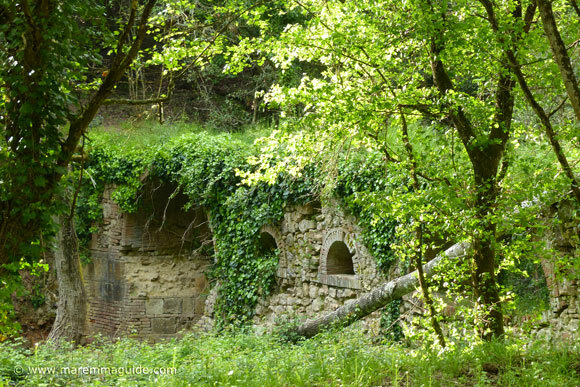 The remains of Elisa Bonaparte's private thermal baths - the "Terme di Montioni". The building now lacks it roof and its walls are crumbling in parts, but inside you can still see where her two marble baths made in Canova - yes, she had two! - would have sat. The sulphurous waters - that reach 31 C - come from two natural thermal springs that were discovered during the alum excavations. 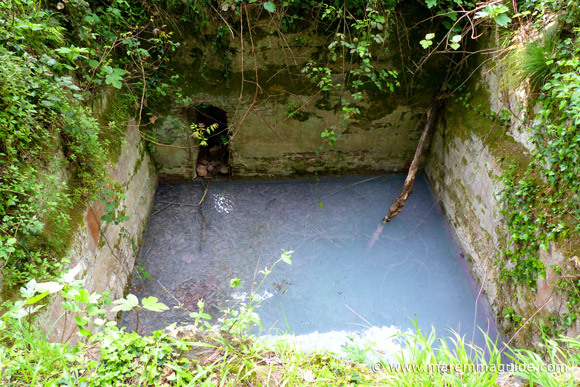 To supply Elisa's private spa the waters were pumped from their source into the baths. The baths have survived. 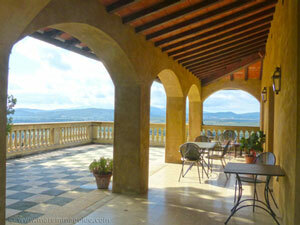 One of which can be seen not so far away in the interior garden and courtyard of the Villa Granducale of Follonica. The address if you want to see it is Via Bicocchi, Follonica, which is the main street that runs parallel to the coastline. The second, a little further away, on the Isola d'Elba, in front of the entrance to the Palazzina dei Mulini in Portoferraio: the same port where her brother was imprisoned. The sunken area behind in the photograph below is the old spa cistern. The remains of Elisa Bonaparte's sulphurous thermal bath. 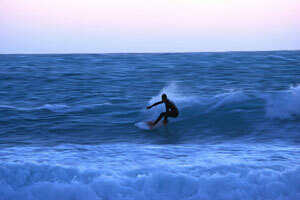 And yes, the water is a purple blue colour! But that doesn't stop the local wildlife taking a dip or two and enjoying them ! At one time it would have been possible to have bathed where Elisa did. For, following a visit by the then Grand Duchy of Tuscany, Leopold II, in 1856, he ordered that the "terme" be restored for public use. They were opened that same year, but closed again just five years later and have remained so to this day, due to shoddy workmanship resulting in insufficient water levels within the cistern. 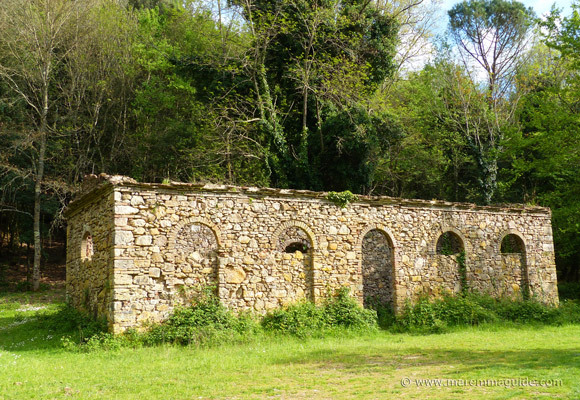 To see the thermal bath building take the left hand trail at the end of the car park in Montioni, over the bridge, and continue past the ruin of a building on your right , then a private dwelling behind a hedge, and the "terme" is situated in a small clearing on your left. Mum's be aware that if your children are running ahead along the lane, access to the remains of the baths is open and unprotected. From here you can choose to continue along the vehicular trail - easy walking- through the woods. Or take the rough stony footpath - that isn't at all suitable for wheelchair access - through the gates on the left. This path will take you uphill - it isn't steep - to a further "grotto" and an abandoned house. The richness of the alum deposits at Montioni was first discovered in 1474 and were mined until as recently as 1938, when the then owners (SIMEC) declared bankruptcy. To see the alum mines closest to the car park in Montioni - those in these photographs - take the path at the end of the car park to the right and go up the hill past the monument to Elisa Bonaparte on your left and continue past the white "palazzo" on your right that was once her private residence. The footpath takes you right past the front door and you will hear barking from a dog as you approach, but he/she is contained in the garden below and so won't bother you. The path continues through the woods and just a short distance later you will find a clearing with picnic tables and this path and gate. Take the path - it is short and a bit slippery in places but not difficult - to its dead end. 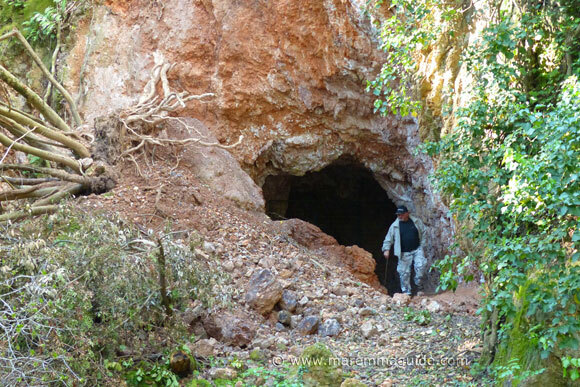 At which point you will see the entrances to the mines. Needless to say the old mines aren't meant to be explored unguided. In the middle ages, the area now covered by the park was home to no less than five castles - called "la Castellina", "Castello di Montioni Vecchio", "Castello di San Lorenzo", "Castello di Valle", and the "Castello di Vignale" - and a tower. Today, what little is left of one - the "castello di Montioni Vecchio" - by 1300 it was already in ruins - may be found at the summit of Poggio di Montioni Vecchio. Montioni's tower - called "la Pievaccia" - however, is still standing - well most of it. 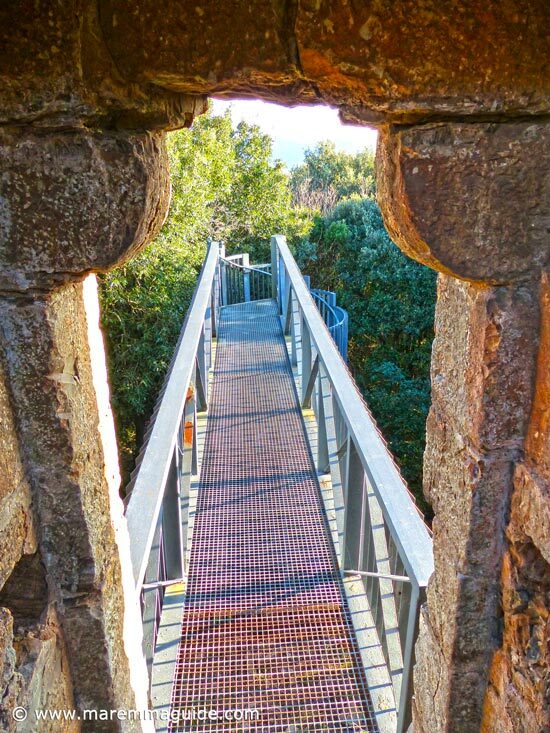 Once a fortified church serving a now disappeared village - and you can reach its current day heights with a stunning view of the Gulf of Follonica and Maremma's metalliferous hills via an external wrought-iron spiral staircase and tree-top walkway. For more photos and the shortest route to reach it: Torre della Pievaccia. The Interprovinciale Park of Montioni is also a wonderful example of how different authorities can work across man made boundaries and red tape to do something together with success, for it is run by both the Provinces of Livorno and Grosseto, and covers land within the territories of five "comuni" (municipalities): that of Follonica and Massa Marittima within Maremma Grossetana, and Suvereto, Piombino, Campiglia Marittima and Monterotondo Marittimo within Maremma Livornese. It is also contains a State Natural Reserve and is part of the system of "Parchi della Val di Cornia" - parks of the Val di Cornia. 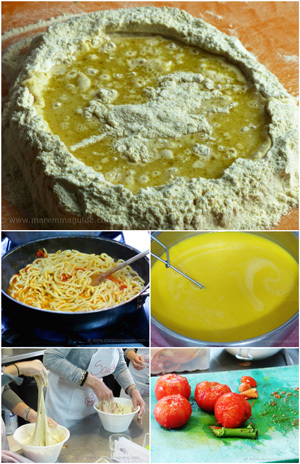 That is no mean feat in Italy! 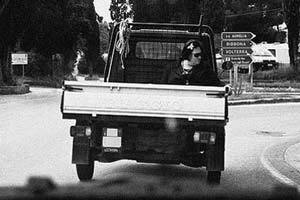 The ninety-nine hectares of the Riserva Naturale Statale di Pogggio Tre Cancelli was established in 1971: forty-nine of its ninety-nine hectares are completely closed to human contact or intervention. 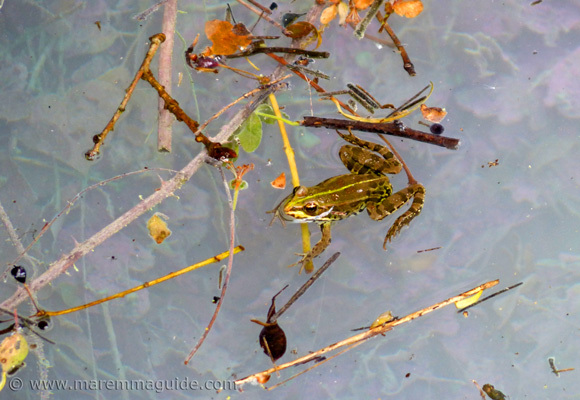 The park is home to a wonderful wealth of animal life, some much shyer than others! 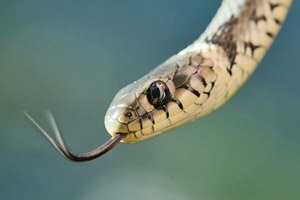 So as well as some needy eyes staring at you hidden in the undergrowth or from up a tree - the wood is home to snakes including vipers - some will as plain as day stand and stare at you from not so far away in the macchia or even in the car park! 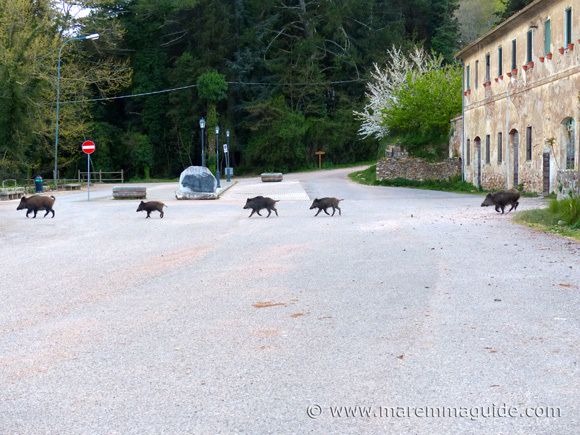 Wild boar sow in the car park at Montioni in Maremma. For the birdwatchers amongst you, suffice it to say the list of birds that live in these woods and their periphery is long enough to fill a book. Amongst the birds of prey you will be able to spot the Short-toed snake eagle, the Eurasian sparrowhawk, Common buzzard, Kestrel, Northern Harrier, Montagu's harrier, the European honey buzzard and Peregrine falcon. The owls include the tawny owl, Barn owl, Little owl and the Eurasian scops owl. A note about snakes. 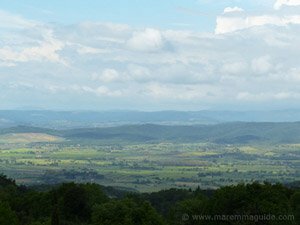 Maremma, like the rest of Italy, isn't over-run with hissing spitting poisonous snakes. Far from it! In fact of the few that we do have, most would prefer not to met you at all - it's nothing personal! - and there is only one poisonous one, the viper. Find out more here. 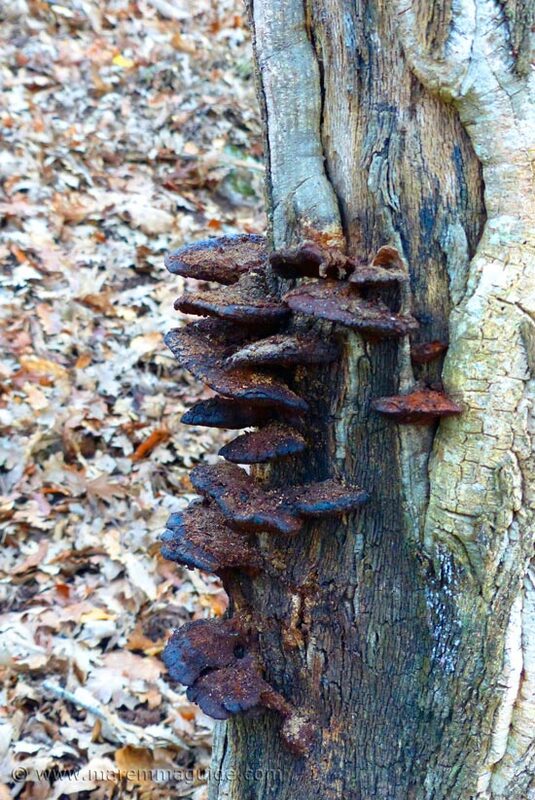 So you can rest easy about taking a walk in its woods. You just need to be sensible - ie. don't let your little ones lift-up rocks to see what is underneath them or put their hands into long grass without you first poking a stick in etc - and avoid the month of September if you can. 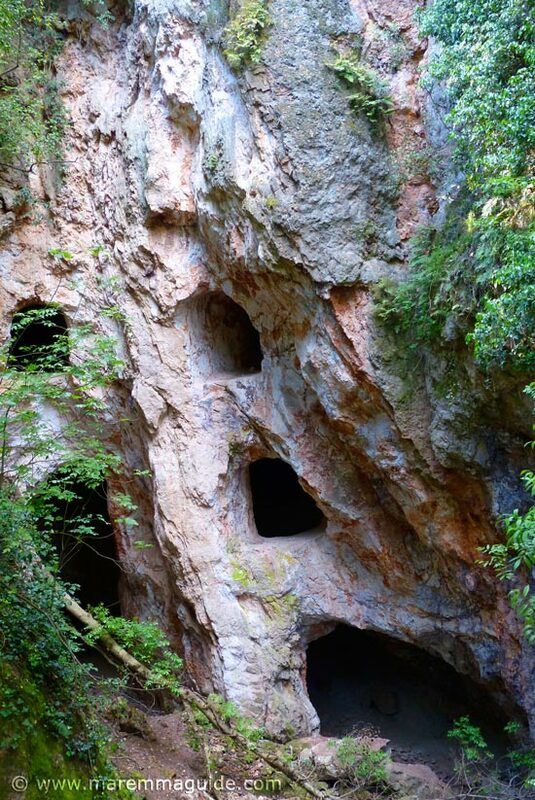 And if you are in the vicinity of the alum caves at that time you might also get a sighting of either of the Greater horseshoe bat or the Lesser horseshoe bat. This fox regularly visits the bar for hand-outs. The last time I saw him he had a nasty wound on his flank but considering sipping an aperitivo offered in a glass by one of the bar's clients! Now I'm not going to tell you that you need to worry about the wolves or that you will likely see one on your walk, for that is a very rare chance indeed. But if you know what to look for, you will be able to spot their tracks. 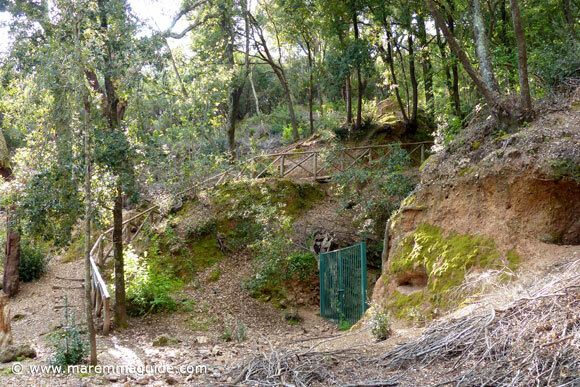 What you will see are lots of lots - you cannot miss it anywhere you wander through the woods - the rootings, tracks and baths of the wild boar. You will probably hear them too and, if the woods aren't full of acorns - "ghiande" - that they love to eat when you visit, you'll find them approaching you in the car park in the early morning or at dusk looking for a food handout! One Sunday I saw a mum encouraging her very young daughter to feed a boar sow with her potato crisps direct from her hand and, despite our words of warning - in this instance I couldn't stay silent - she remained unconcerned and continued until the girl herself decided she had had enough. Please, please be aware that, although these animals gather here most days and are fed by passers by, they are still wild. 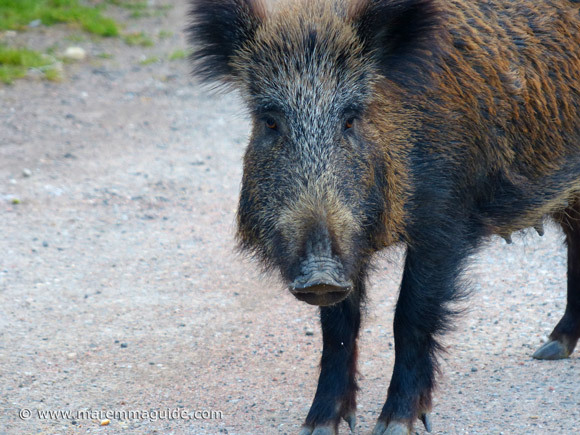 And as Sophia's Italian grandfather and "cacciatore" (hunter) remarked - even looked on with disbelief - "... if the boar bites her hand it would be nearly impossible to retrieve it from the boars teeth...". Enough said. As a consequence of mans activities, the dominant plant life and macchia covering of the Parco has changed over the centuries. 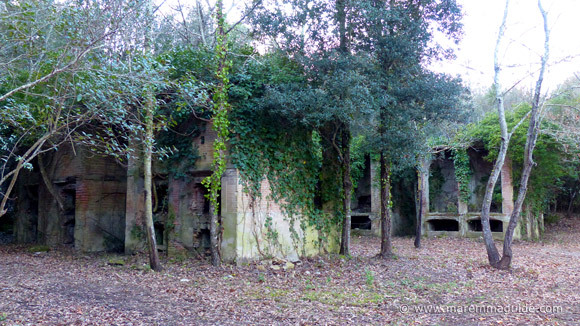 What was once a mining centre, with wood felled to feed the alum ovens at Montioni, and thence massively exploited from 1800 to feed the iron-ore furnaces at Follonica, more recently became home to "sughero" (cork) and charcoal production, olive groves, cereal and vegetable cultivation. Now since all abandoned. Today the woodland comprises a mixed forest dominated by evergreen species, with deciduous oaks and temperate Mediterranean plants rich in herbs. Scrubland had penetrated the abandoned olive groves and fields. 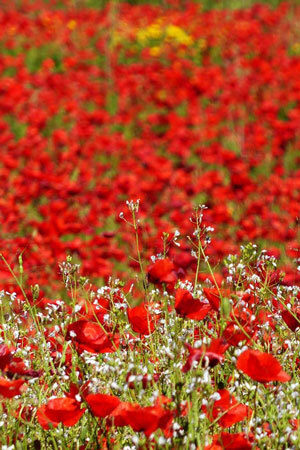 As a "riserva naturale di popolamente animale", it is land protected for the re-population of wildlife and fauna. And it has been successful, for the Parco Naturale di Montioni is now rich in both, and amongst the 448 species of plants that grow here today, no less than 58 are rare examples of Mediterranean flora. Three of those - only one of which would probably get you getting your cameras out to take a photo if you are very lucky to see it - are very rare finds indeed. They are the very rare for central Italy dandelion, Geropogon glaber L. T scap. In Italian, the "Barbadi becco annua". The Fowl bluegrass, Poa palustris L. H. caesp., found in northern Italy (with the exclusion of Liguria) and in the Neapolitan area, but considered disappeared everywhere else. 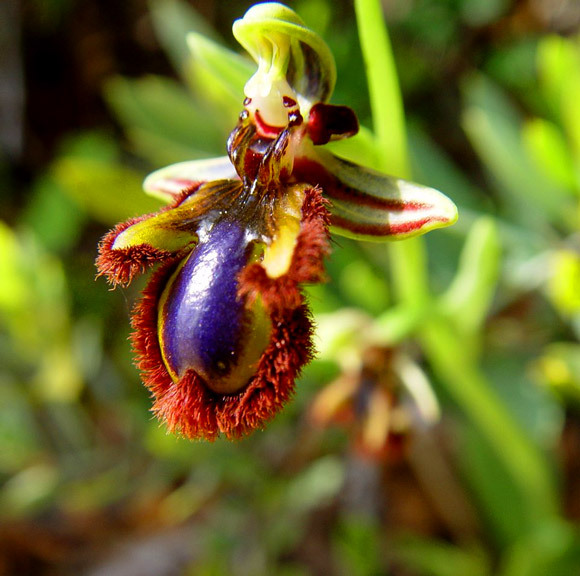 The Parco Naturale di Montioni is home to many wild orchids, but is the photogenic orchid, Ophyrys vernixia Brot. subsp. ciliata (Biv.) Del Prete, that is the rare one. 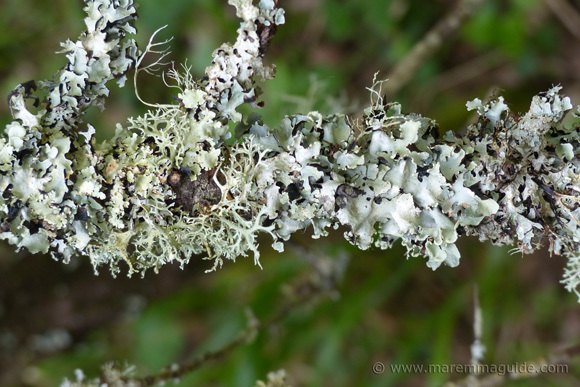 Whilst common in Sicily and Sardegna, it is a very rare find in the Italian peninsula and even in Montioni, for only one specimen has ever been seen - on 28 April 1992 in Poggio Saracino. The orchaediea Ophyrys vernixia. Photo by Lumbar. 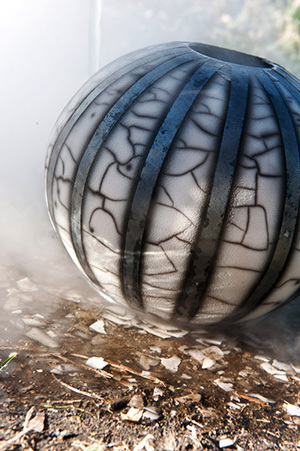 Those rare beauties aside, there is plenty to photograph anytime of the year, even in winter. 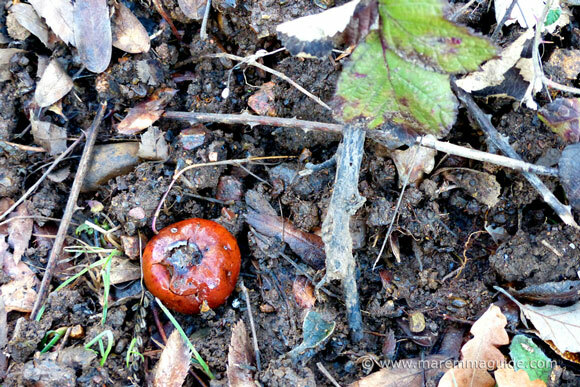 NOTE: It is forbidden to go mushroom hunting in the woods, or to collect any other plant, flowers or woodland floor produce, including wood. Or to light fires. 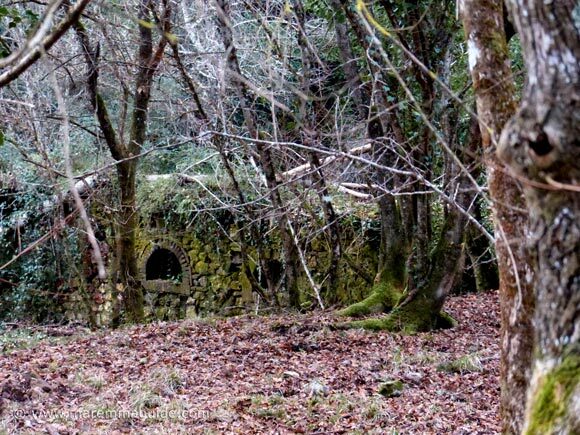 Scattered throughout the woods are the ruins of old buildings that date from Elisa's time, when the village was at its most productive and prosperous. But you will also come across this little house: Number 99. 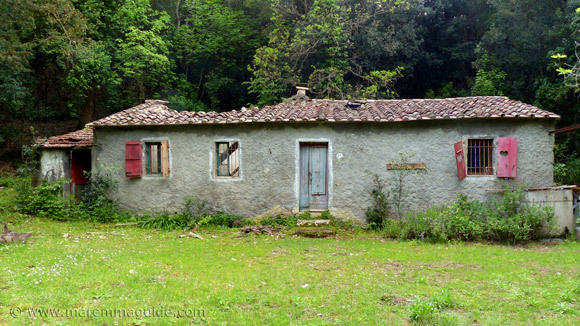 Most probably once a woodcutter or charcoal burner's home, it now lays in rack and ruin, each year crumbling some more. Last year saw the major part of its roof cave in. It just calls out to be photographed and everyone does. I think it is the touch of heart shapes cut from the window shutters and its complete isolation and solitude in the wood that does it. 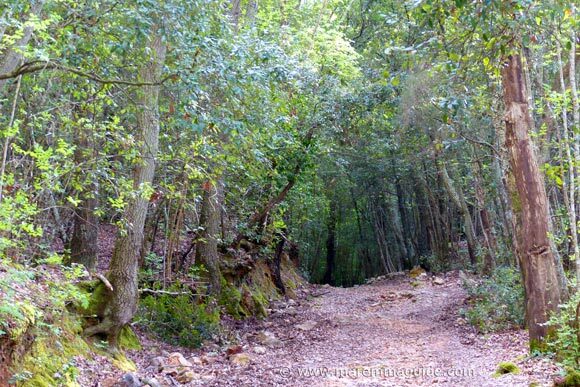 The lanes and network of trekking paths - "Sentieri nel Parco di Montioni" - through the park are perfect for an easy Sunday morning or afternoon stroll kind of thing, to a much longer up and down trek through the woods. 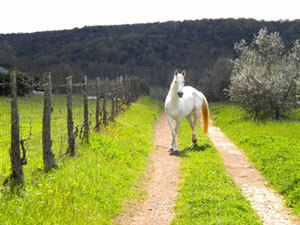 Some are suitable for mountain biking, and those marked as "Ippovie del Mediterraneo" also for horses. This link will take you to nine routes listed in the Il Parco di Montioni web site, seven of which are suitable for all three activities, two are for shorter and easy circular walks in the woods around the village of Montioni, and one for trekking only, but it is a long one, that will take you from Montioni to Pratini di Valle near Follonica and past the Pieveccia tower. The latter is indicated as unsuitable for mountain bikes and horses due to its steep stretches of terrain, but I have to say that mountain bikers evidently do pass by the tower even though the hill is steep. How anyone could get up it on bike is beyond me, and maybe going down doesn't scare some as much as it would me! Click on the titles for each for details of their lengths, altitudes, duration, difficulty and an ordnance survey style map of the route. 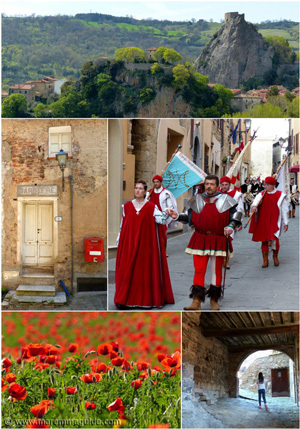 The annual Tuscany Walking festival also takes you through the area - this link will take you to the page with details of when and where. Montioni Natural Park isn't hard to find on a Google Earth map: just do a search for Montioni and everything coloured green all around for miles is it! If you are lucky when you visit one of Maremma's Tourist Information offices or find a Colline Metallifere information point in a shop in one of its villages (there is one called the Bazaar in the village of Valpiana, just a few kilometres from Montioni) they might have a supply of this free map which is perfect if you are thinking of exploring the park as it has the whole of the Parco Interprovinciale di Montioni included in it as well as some other great places to go trekking - with their details too. But supplies do run out fast, so get one while you can if you see it. 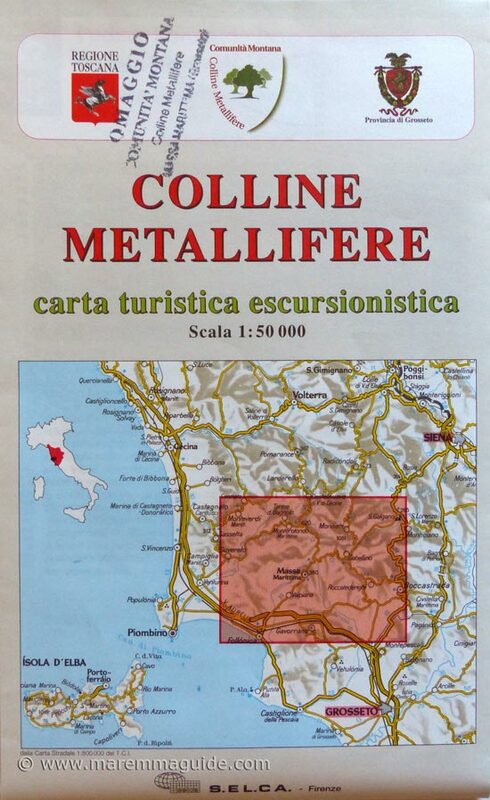 It is produced by the Regione Toscana, the Comunita Montana Colline Metallifere and the Provincia di Grosseto, and called the "Colline Metallifere carta turistica escursionistica Scala 1: 50 000. There are two main access point to the park. 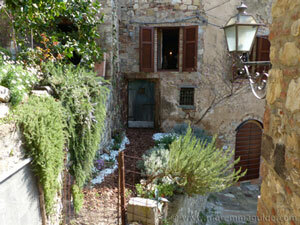 The first, and the one I would recommend for a first time visit, is from the car park in the village of Montioni. Most of the trekking routes start from here and the Elisa Bonaparte monument, the "terme" spa, and alum mines etc are all within a few feet/very short walk away. There is plenty of free parking - unless that is there is an old sports car rally stopping over, or the day of the Tuscany Walking festival. The village bar and restaurant also comes in handy for a coffee stop after a good long walk or mountain-bike trek. 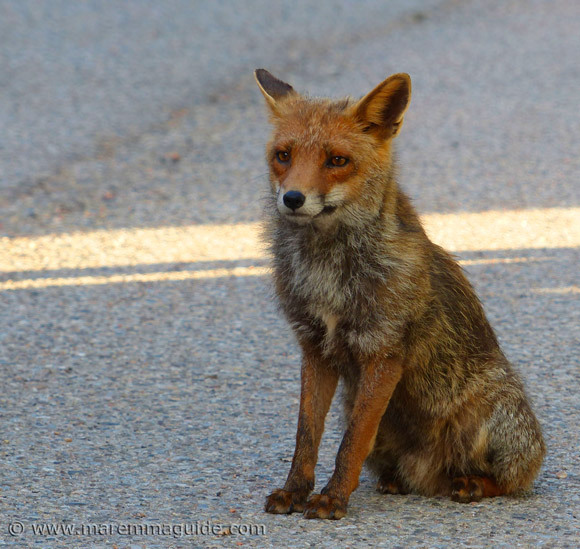 You might even get to meet the village fox :) and early evening sightings from an outside table of some of the many local wild boar are practically guaranteed. The second - marked on the location map - is from the old Aurelia road that passes behind the seaside town of Follonica and the track to the takes you to a new visitors centre. Note: I haven't found it open when I have visited. Apart from the vehicular access that veers to the right after the "terme" and continues into the park, the footpaths are stony and rough and unsuitable for wheelchairs. The Fabbricato dell'Imposto in Montioni. 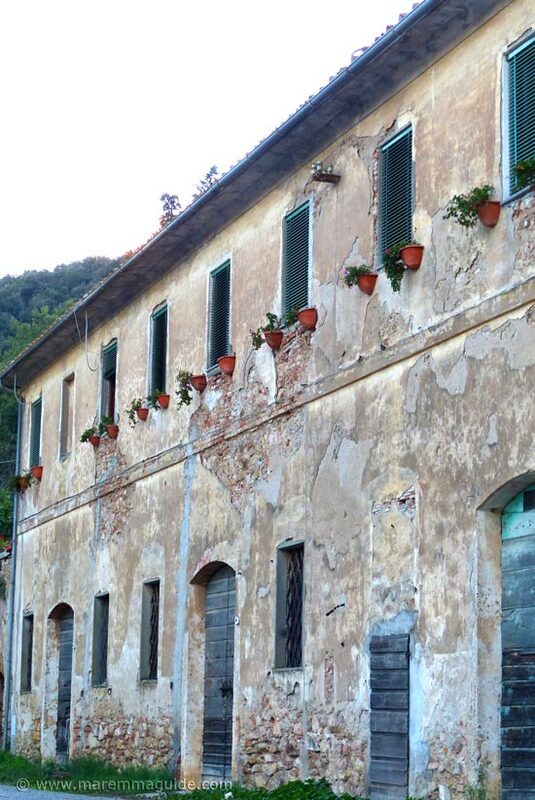 There is something about the row of window flower pots on this building - the Fabbricato dell"Imposto - that always has me photographing it every time I visit and I visit lot! The upstairs is lived in and the ground floor a storage area. 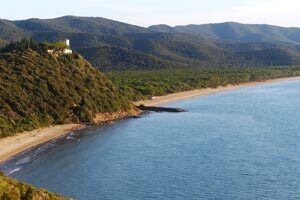 Situated just over the border from Maremma Grossetana in Maremma Livornese territory, Montioni is tiny - blink as you drive past and you will miss it! - but still well worth a stop even if you aren't contemplating a long walk.